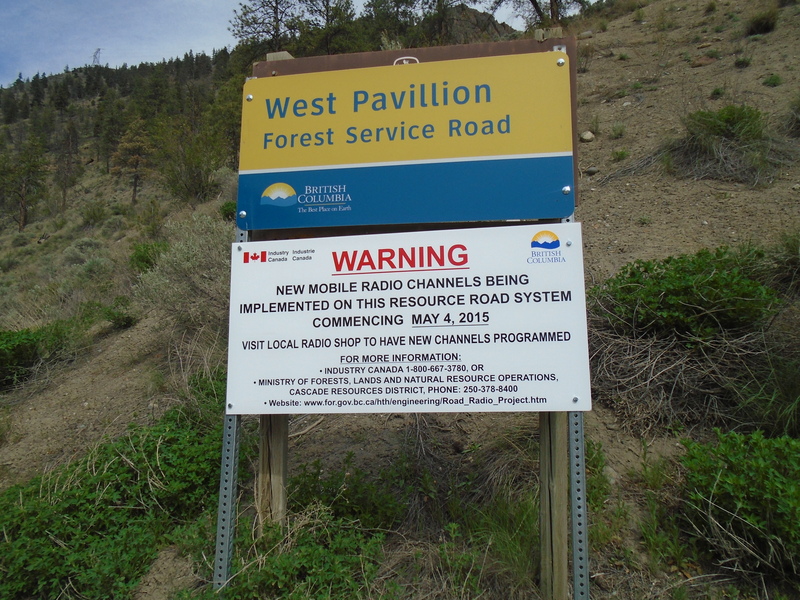 In the last couple years the BC government has changed the radio frequencies used on all the forest service roads (FSRs). They used to post the frequencies used so that you could type them in to your handheld radio. 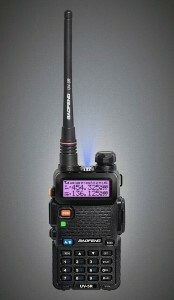 With your radio programmed you are able to communicate with other users of the road, ie. logging trucks. The radio system is primarily there as a safety procedure to prevent collisions on BC’s narrow backroads. The cryptic system that they are now using takes away that safety tool if you are not prepared. I was caught off guard in 2015 when the radio frequency was removed from the West Pavillion FSR which I use to access some of my claims. A sign that mentioned the change was in place but it did not state the new channel. I found a decent map online that shows which FSRs are using each channel. This map also shows all the FSRs which is cool. You can look around without having to pull out your backroads map book. Here is a link to the map, Chilliwack FSR Map. 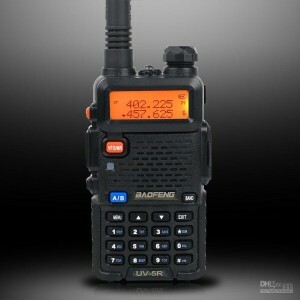 I am using a Baofeng UV-5R programmable radio. I can’t say enough good things about this radio. It is inexpensive (~$30), powerful and has lots of memory channels. The coolest feature is that they are field programmable too. More on the Baofeng UV-5R here, Gear Review: Baofeng Handheld Radio. This guide works for other radios such as a Kenwood or Motorola, although you might need different software. The cable that I’m using is a FTDI 2-pin Kenwood style. 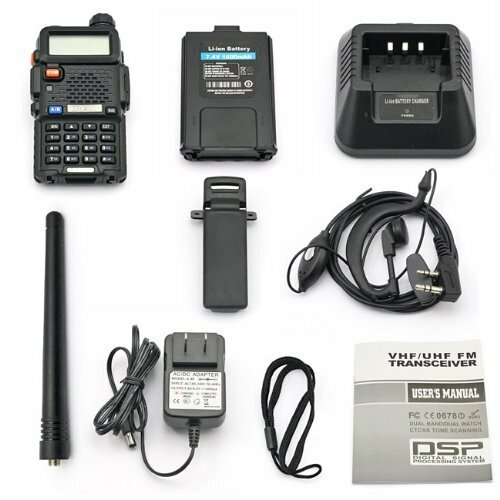 It works for Baofeng and Kenwood radios. For this post I’m using my laptop running Ubuntu linux. But this guide will work with Windows too. The software is really the key to the whole programming procedure. 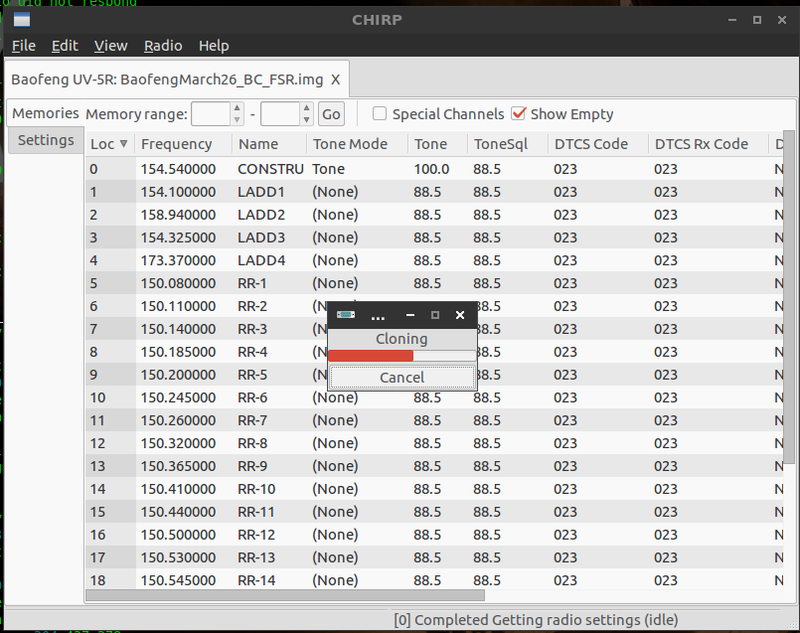 There is an excellent open source program called CHIRP which stands for CHInese Radio Project. 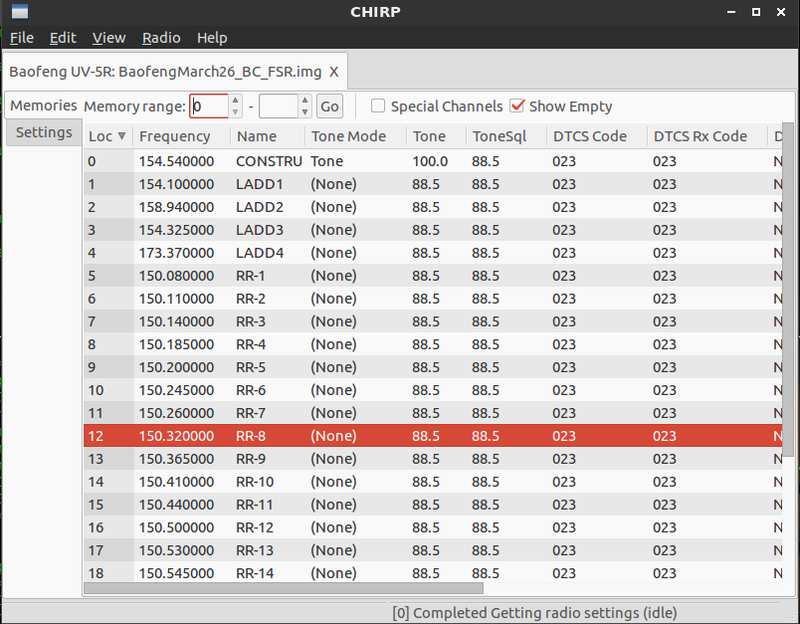 CHIRP was designed to make it easy to program cheap Chinese radios such as the Baofeng, it also works on just about any other radio out there and its free. OK lets get started. The first thing that we have to do is get a list of frequencies. I found them on a government website, but I’ll save you the trouble and post them right here. That will download and install the latest version from Ubuntu’s repositories. If you are running Windows or Mac you can download CHIRP from their website here, CHIRP Site. Installation is easy, just run the .exe file and you’re good to go. OK, now that CHIRP is started you have a few options. You can clone your radio’s existing channels and modify them. You can start a new file or load in an existing one. Lets start one from scratch. Click on the File menu and select “New”. In my example I added a couple extra channels at the top. It’s a pretty straightforward application. The window functions a lot like a spreadsheet, there is a row for each channel and different parameters are defined in each column. The BC RR channels are pretty basic so you can ignore most of the columns. 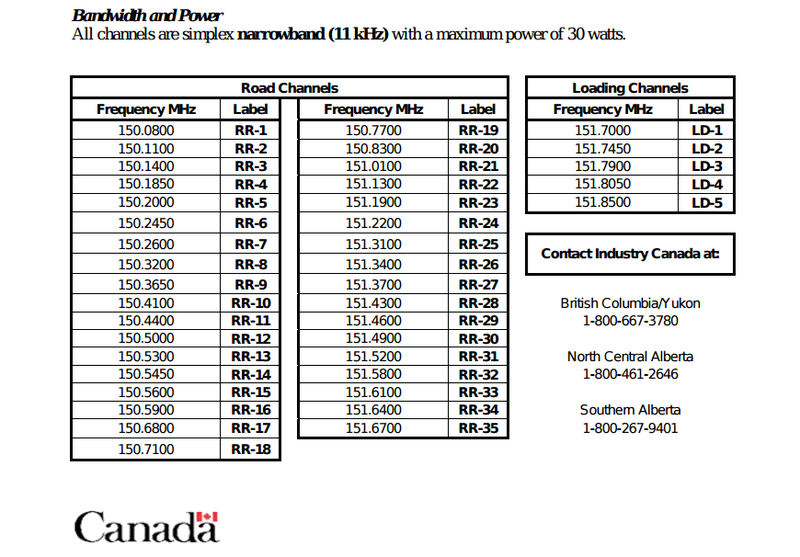 The RR channels are simplex, that means that they use the same frequency for transmit and receive. Most public channels are simplex. They have no carrier tone or any other funny business. So we just have to enter the frequencies and the name. Leave the rest of the settings at the default values. That is telling us that the programming cable is on port “ttyUSB0”. In Windows the easiest way is to look at your serial ports in the device manager. Now you can upload the channels to the radio. Turn on the radio with the programming cable attached. Then choose “Upload to radio” from the Radio menu in CHIRP. You’ll be prompted for the serial port, in my case ttyUSB0. You will also need the radio make and model. Once you hit OK, the upload will begin. You’ll get a nice progress bar to show you how its going. That’s about it. Make sure that you turn off the radio before you disconnect the programming cable. 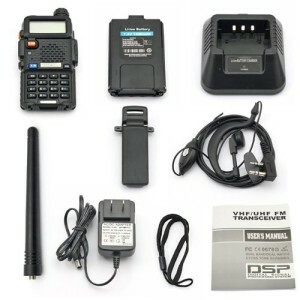 Now you’re ready to hit the back roads and communicate with other travellers. Five years ago you rarely heard the word “drone”. When you did it brought up images of military air strikes and futuristic sci-fi movies. 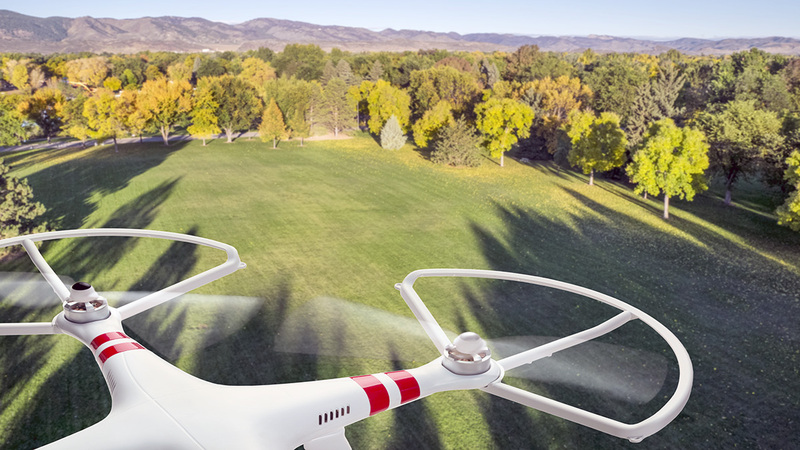 In 2015 drones have become commonplace and are starting to be used in many industries. A drone provides many advantages over traditional fixed wing data collection and the low cost makes it a practical solution to many problems. Hobbyists are also quickly getting into the game due to dropping prices. It is amazing how many people will drop $1000 or more on these high tech gadgets. Drones, also called Unmanned Aerial Vehicles (UAVs), are flying robots that are able to execute a task autonomously. They come in several different forms but they all have the same core components. The four critical drone components are Autopilot, Propulsion, Sensors, Payload. The autopilot is the essence of what makes a drone. 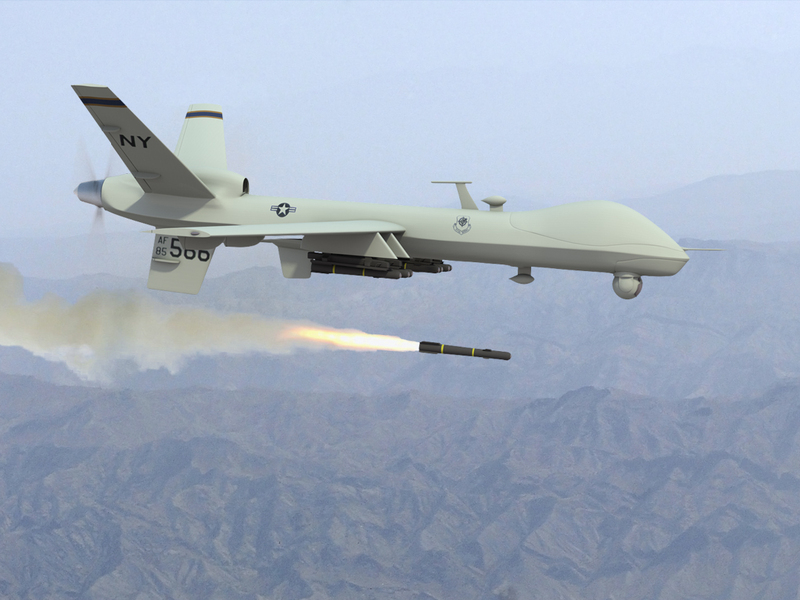 In order for an aircraft to be called a drone it must have the capability to fly without human intervention. The usage of the word drone has been misconstrued in recent years. Just because an R/C aircraft has four rotors and a camera does not make it a drone, it muse have autonomous flight capabilities. Autopilots are sort of the brain of a drone. They monitor all the information coming in from the sensors and send signals to the control mechanisms based on their programming. The autopilot software functions much like a thermostat. For example if the drone’s alitutde is set at a certain number the autopilot will contol the aircraft to maintain that number. If the drone rises higher the autopilot will adjust the controls so that the drone descends, if its too low it will set the controls to climb. The autopilot operates in this way for hundreds of different parameters such as airspeed, altitude, GPS position, attitude (3D orientation), and many more. The use of autopilots goes back to at least the late 1940s when experimental aircraft were able to operate completely by computer control. Modern commercial airliners actually employ autopilots that can control the aircraft from takeoff to landing, the only thing they can’t do is taxi. Every time you fly on a commercial jet you are riding a large autonomous robot. For a flight to be successful the autopilot must have the parameters for the flight such as flight path, altitude, flight restrictions and settings stored in its memory before takeoff. Once in flight the autopilot will use the preprogrammed information to follow a flight pattern and land at a predetermined location. Watching an autonomous drone in action is quite an experience, they can give the impression that they are thinking for themselves. Sensors on a drone connect it to the real world. They perform the functions that the eyes, ears, nose and other senses do in a human. A drone can only know what the sensors tell the autopilot, much a like a human’s concept of the world is based on what we can see, smell, hear and touch. For example a drone will not have any idea it is heading directly for a tree unless it is equipped with an obstacle avoidance system. The same is true of hitting the ground or a person who walked in front of the aircraft. The pitot/static system is used to measure the current airspeed and altitude. This sensor measures air pressure from a forward facing tube, as air speed increases so does the pressure. The static tube measures the change in barometric pressure which decreases with altitude. The pitot system also measures the wind speed by comparing the airspeed to the GPS speed. 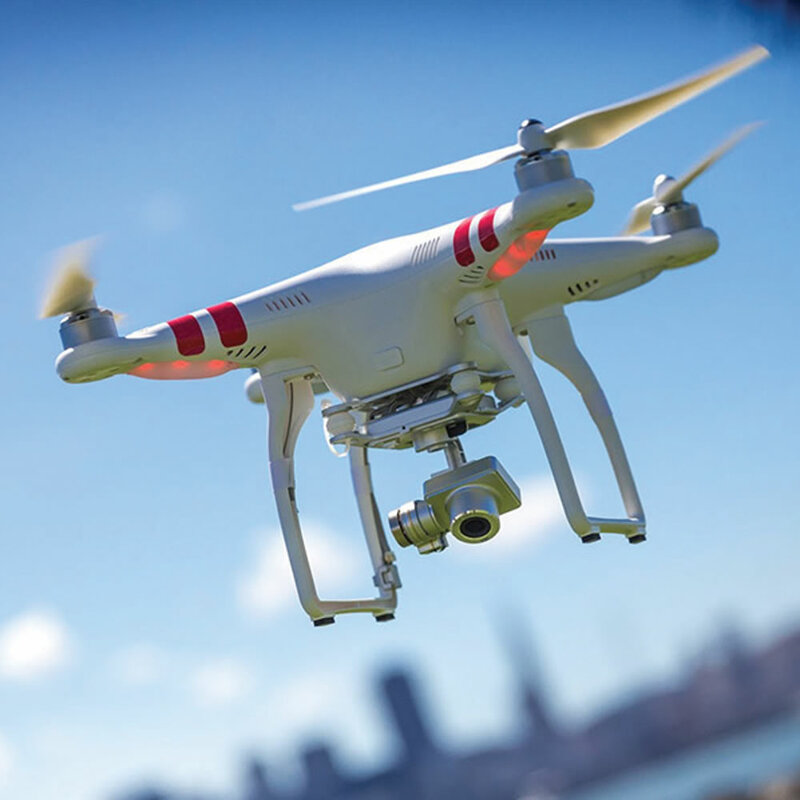 Most drones have a GPS system which is the basis for autonomous flight plans, and in the case of very accurate GPS systems altitude can be measured. 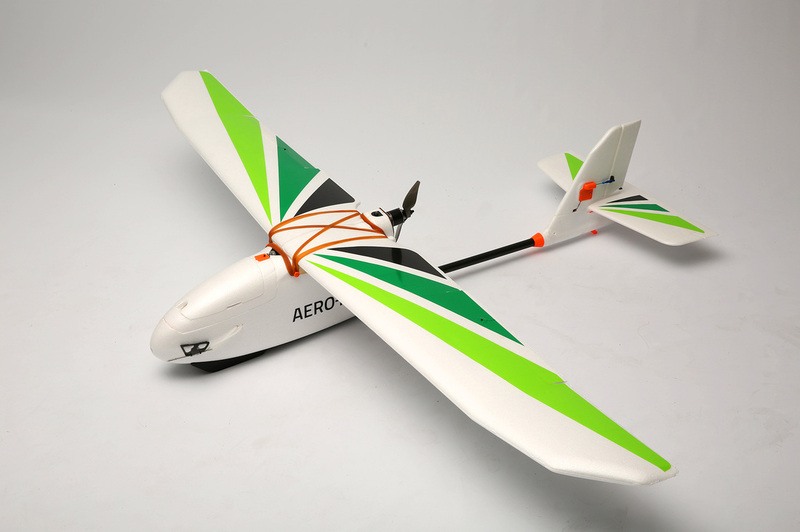 Drones also have a 3 axis accelerometer which monitors the aircraft’s orientation relative to the horizon. Accelerometers are also used in smart phones, they are the device that senses when you shake or tilt the phone. More complex drones have fancy inertial measurement units (IMUs) which use gyroscopes and other methods. 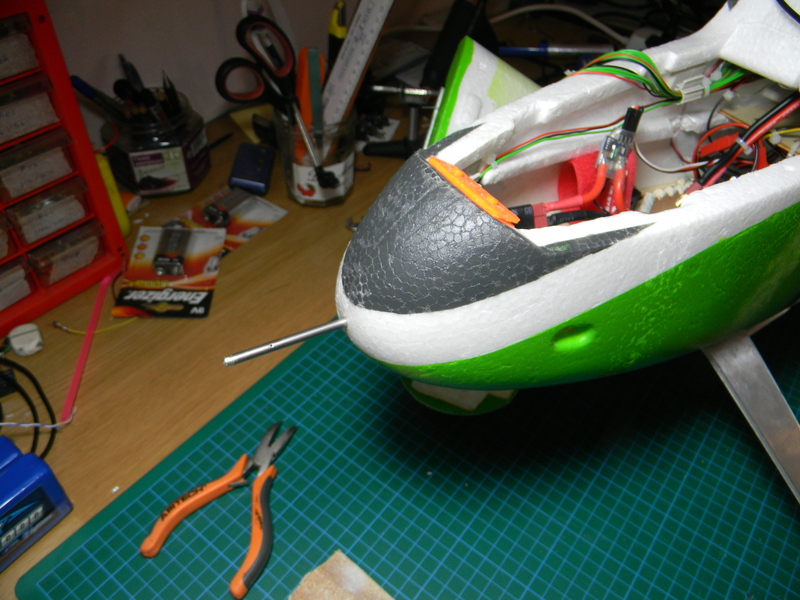 Drones have servos which monitor and adjust the position of control surfaces such as ailerons, or rudders. 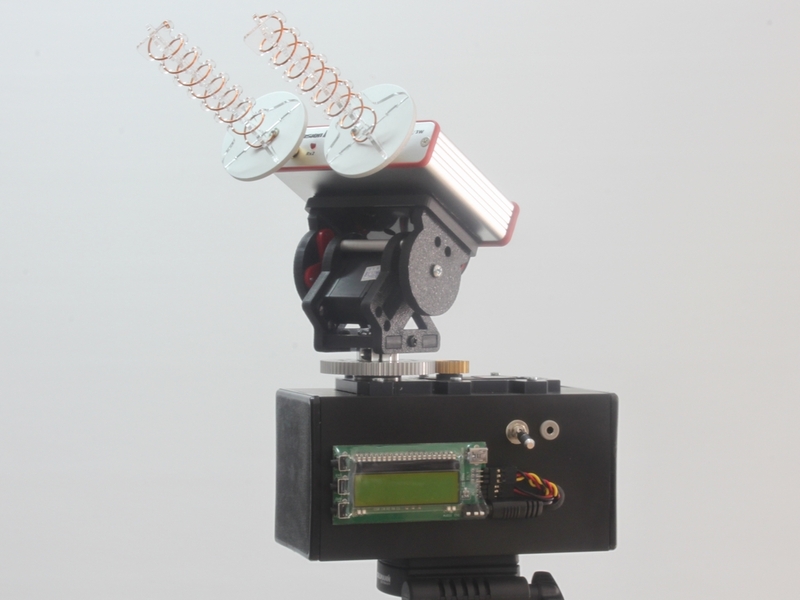 Servos are electric motors that are calibrated to precisely place their control arm. There are countless optional sensors which can add new capabilities to a drone. Some optional sensors are altitude lasers or radar, trasnponders, voltage sensors, magnetic compass, and obstacle avoidance sensors. Gas or heavy fuel motors are used on larger fixed wing drones and are still usually propeller driven. 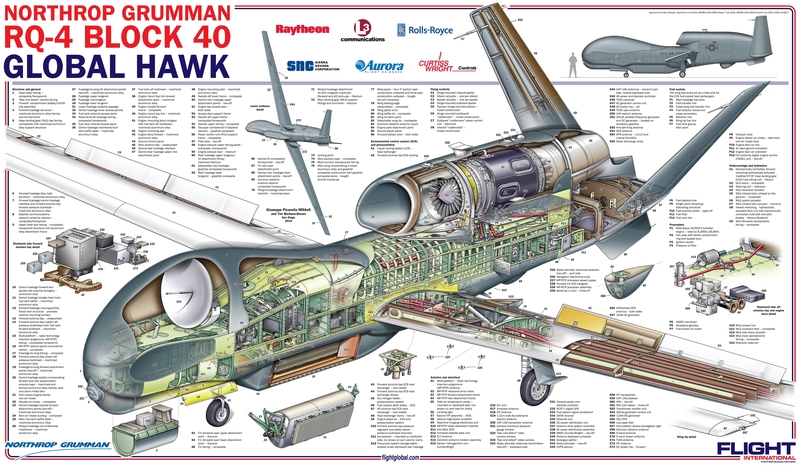 There are a few drones out there using jet and turboprop engines such as the Reaper (armed version of Predator). Rocket engines have been used for decades in target drones. Targets were one of the first uses of drones by the military. 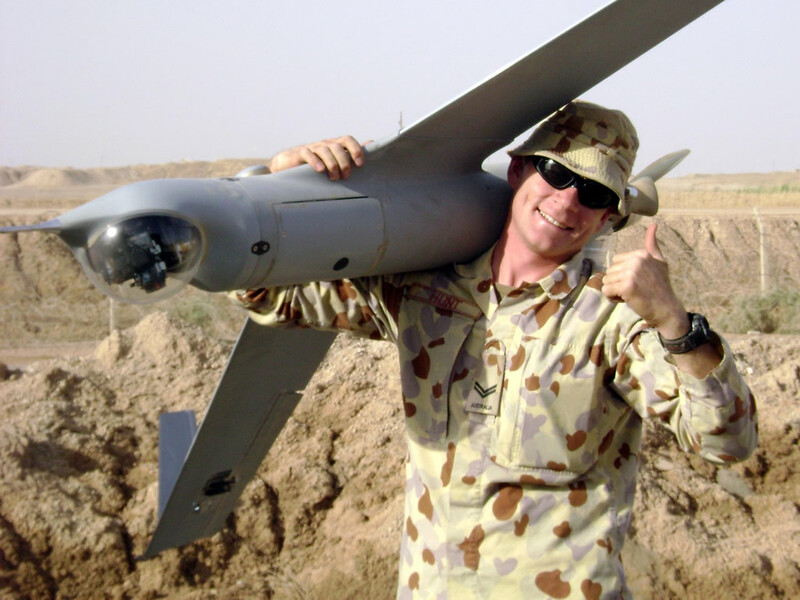 Its hard to believe but military forces around the world routinely shoot target drones which cost $20,000 and up each. Gas or rocket drones run on a fuel source and their flight duration depends on how long the fuel lasts. Gas drones also have batteries for their electric components and some of them have an on board generator. Payload is often the area where the most development work is focused. After all these robots are flying for a purpose. The most common payload is some form of a camera. The majority of drones out there are either taking photos or video. Most small drones consist of a multirotor with a GoPro camera on a gimbal. Mapping drones like the one used by WestCoastPlacer have a down facing high resolution camera that is triggered by the autopilot. Mapping drones also record the GPS position and aircraft orientation with each photo for use in processing. Different kinds of cameras can be used such as infrared, multispectral and hyperspectral. 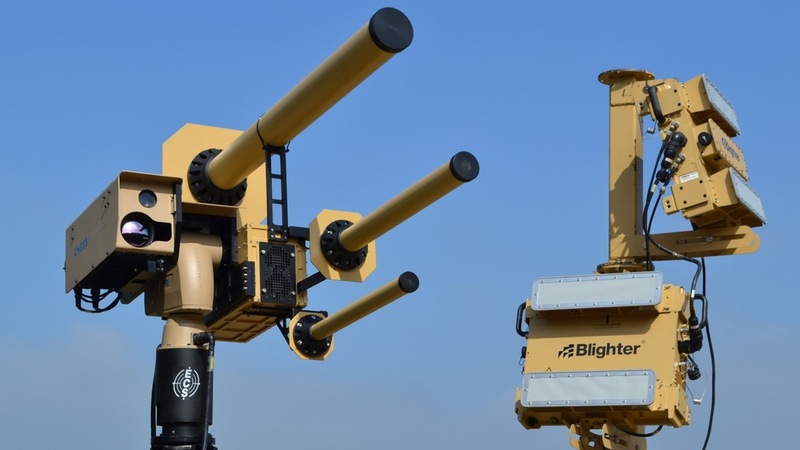 LiDAR laser scanners are starting to be mounted on drones too. It has taken a long time to miniaturize LiDAR sensors to the point that a small-medium sized drone can carry one. 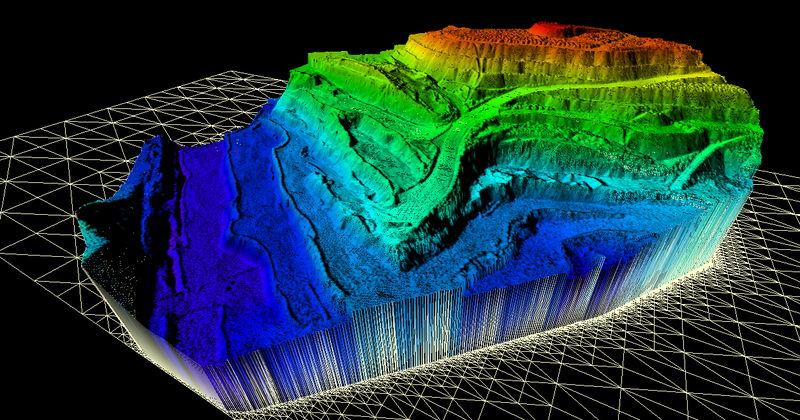 Drone LiDAR sensors to date have not been able to provide classification so that a bare earth model can be produced. Magnetometers are being mounted on drones too (Pioneer Exploration, GEM). 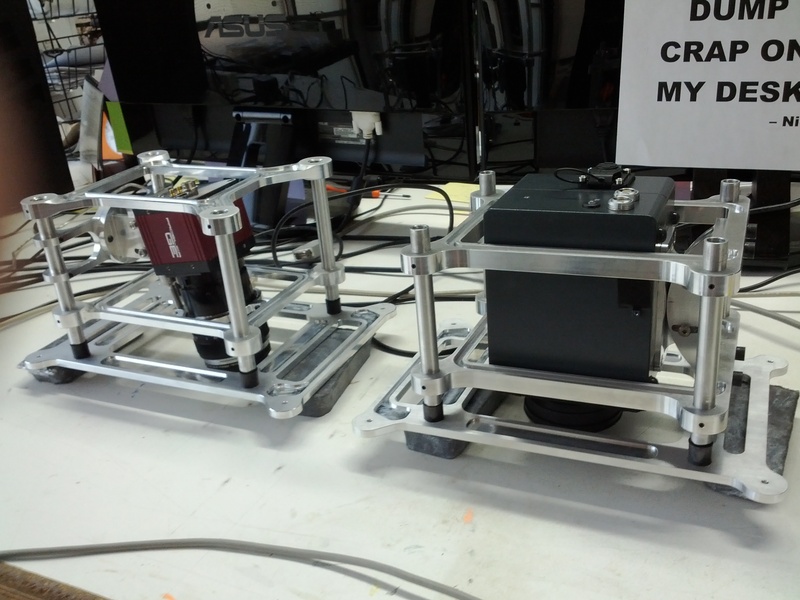 These are geophysical sensors used to measure changes in Earth’s magnetic field. 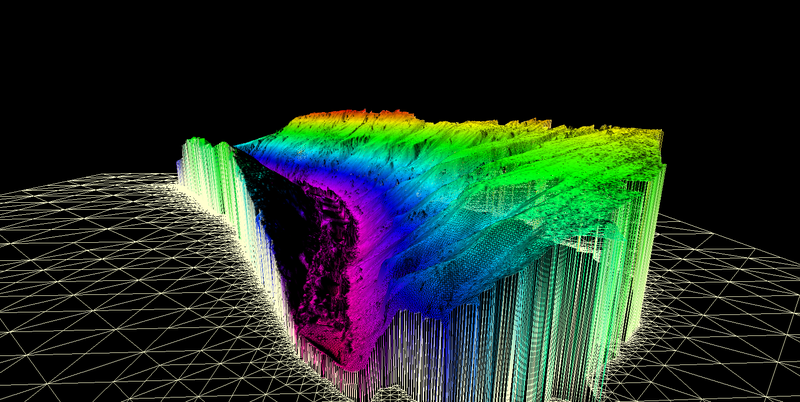 This sort of data is used in mineral exploration and location of land mines and submarines. There are many more payloads out there such as air quality sensors or wifi internet repeaters. Another important component of a drone is the communication system. It is technically possible to operate a drone without real time communication since they fly autonomously however it is irresponsible and in most places illegal to do so. An unmanned aerial system will include some form or radio communication with the operator. The operator will have a radio link hooked up to a field computer with base station software to program the drone and monitor in during flight. On board the drone will be some form of two way radio system which will transmit data to the base station as well as allow the operator to issue commands. Telemetry data received from the drone allows the operator to monitor the flight and make sure that everything is working properly. 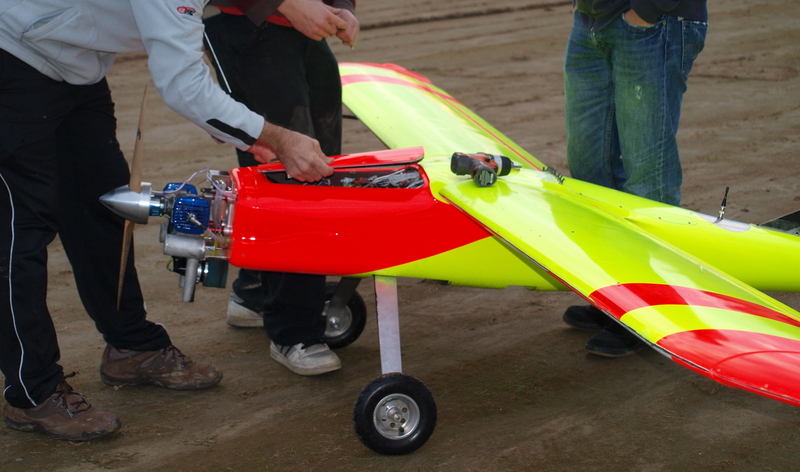 Examples of telemetry data are things like airspeed, battery health or fuel level, position and orientation. 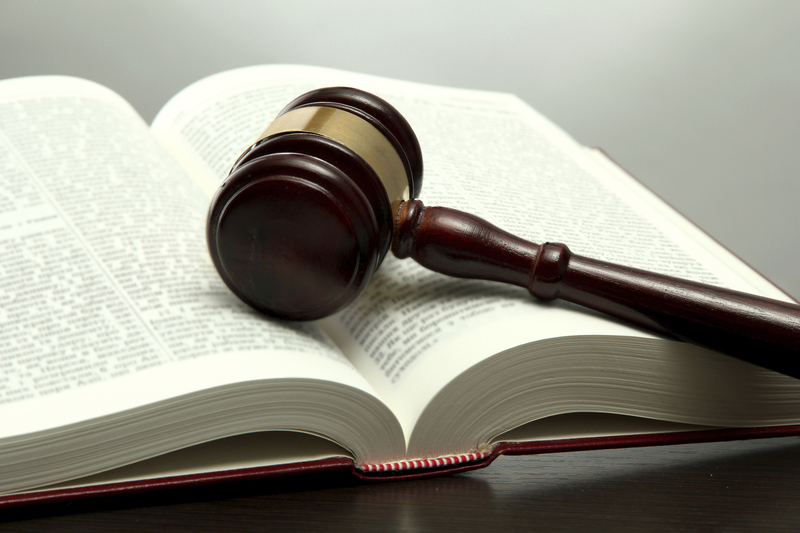 Typical radio frequencies that are used are 900 Mhz, 2.4 GHz or 5 Ghz. Range of a standard system is 5-10 km. Factors that affect radio range are frequency, transmit power, antenna choice and terrain. 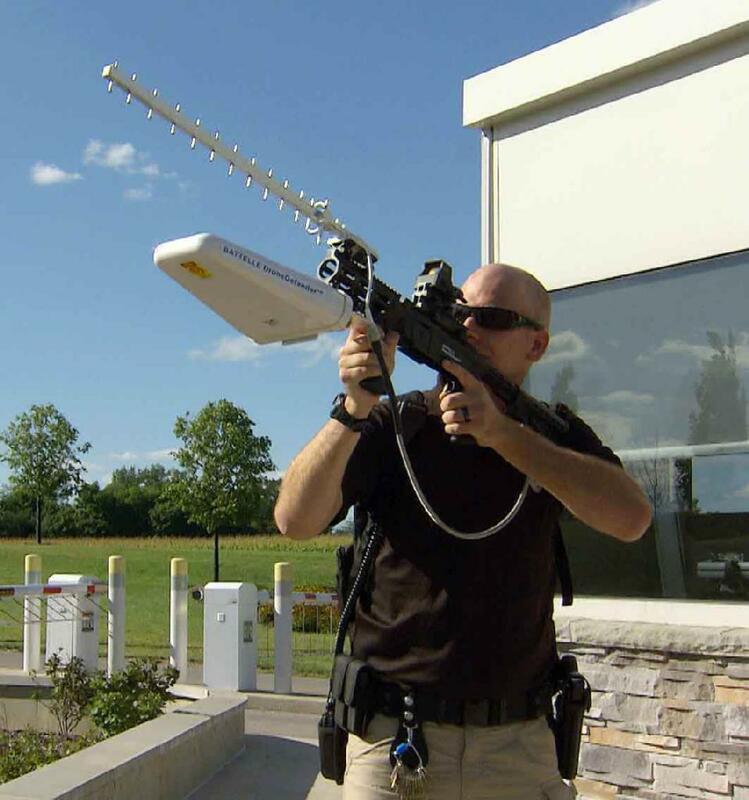 Some drone operators have had great success using directional and helical antennas. 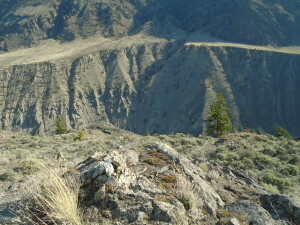 Some helical antenna systems are capable of communicating up to 100km away. 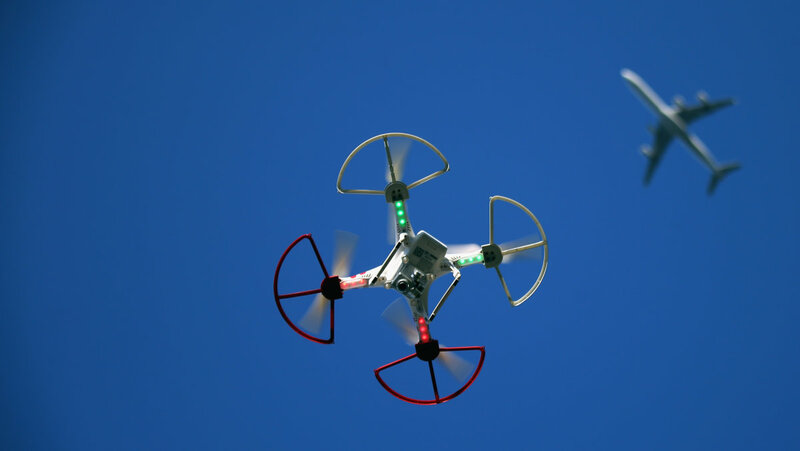 Cheaper drones communicate via WiFi (also a form of radio) to a smartphone or tablet. WiFi range is limited to several hundred meters but can be extended with directional antennas. 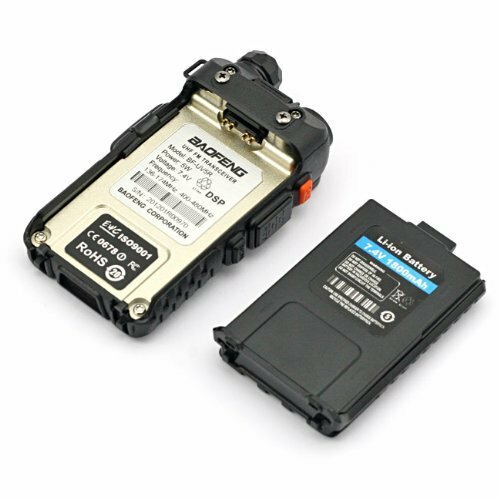 Cellular modems are used in some drones utilizing LTE/GSM networks and can greatly increase the operating range. Essentially you can fly anywhere there is cell coverage. Satellite systems are also used which operate on a satellite phone network such as Iridium. Theses communication systems have virtually no limit on range but have slow throughput and expensive by the minute billing. All the individual parts of drones work together to execute a flight and achieve the goal of the operator. New uses are being discovered for this technology every day. The low price and superior data quality make the UAV a powerful tool for collecting aerial data. In the coming years we are going to see drones used in more and more industries. It just makes sense. Check out our drones page to see the drone services provided by WestCoastPlacer. 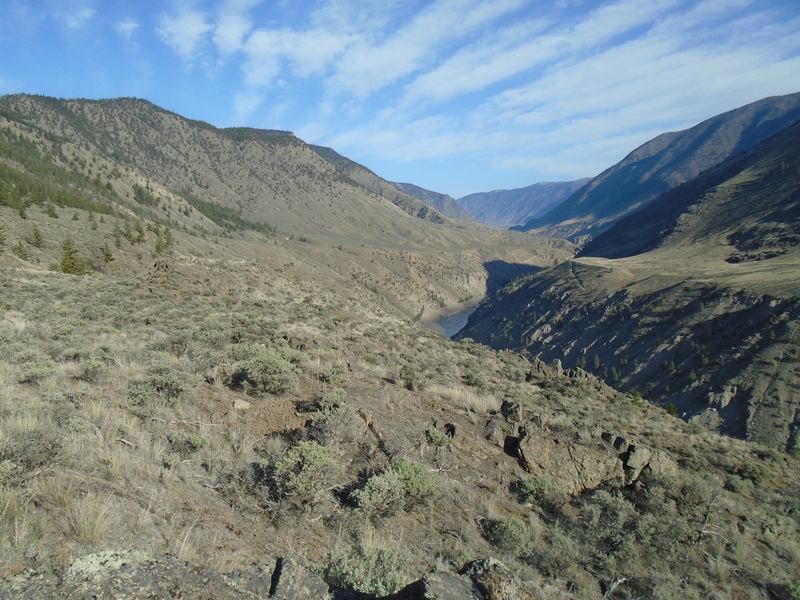 In April I went to check out two claims in the area North of Lillooet, BC. 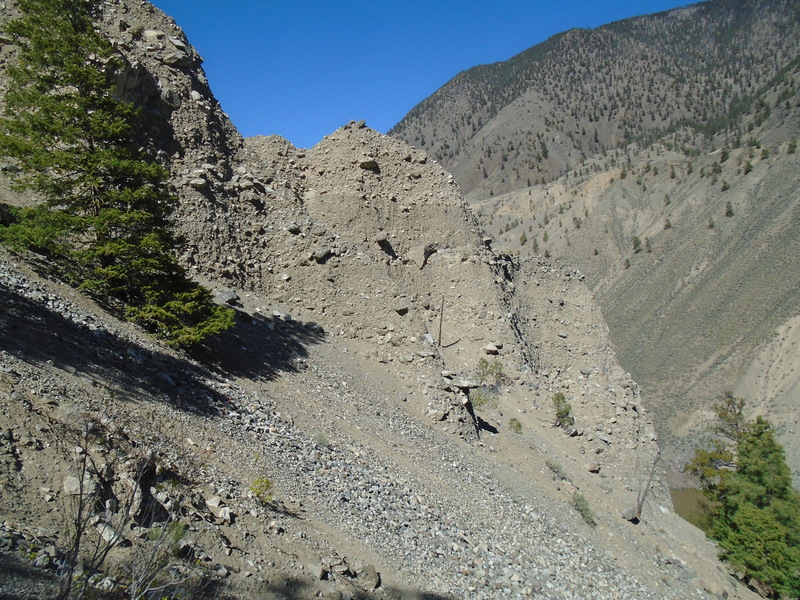 These two claims are close to the one that I wrote about in my Southern Cariboo Prospecting Trip. 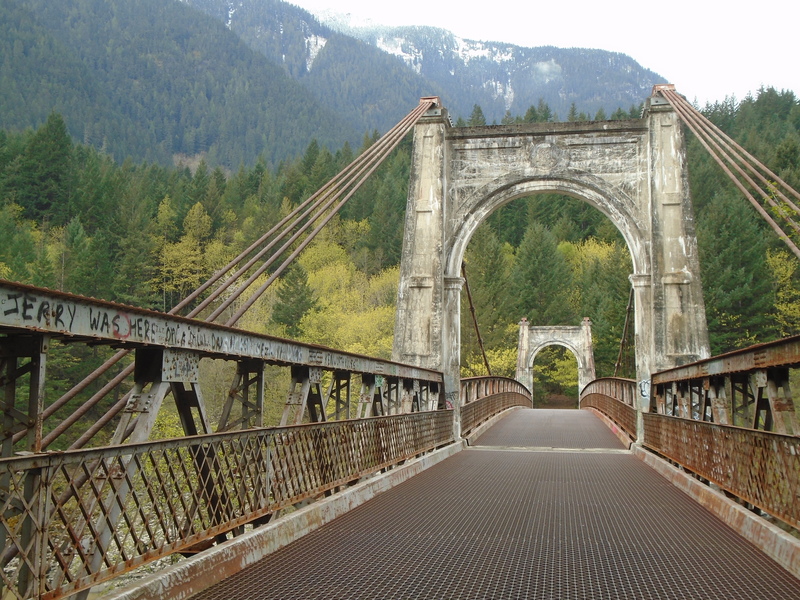 On the way up the Fraser Canyon I stopped at the old Alexandra bridge to get a peep at a claim that I have on the other side of the river. 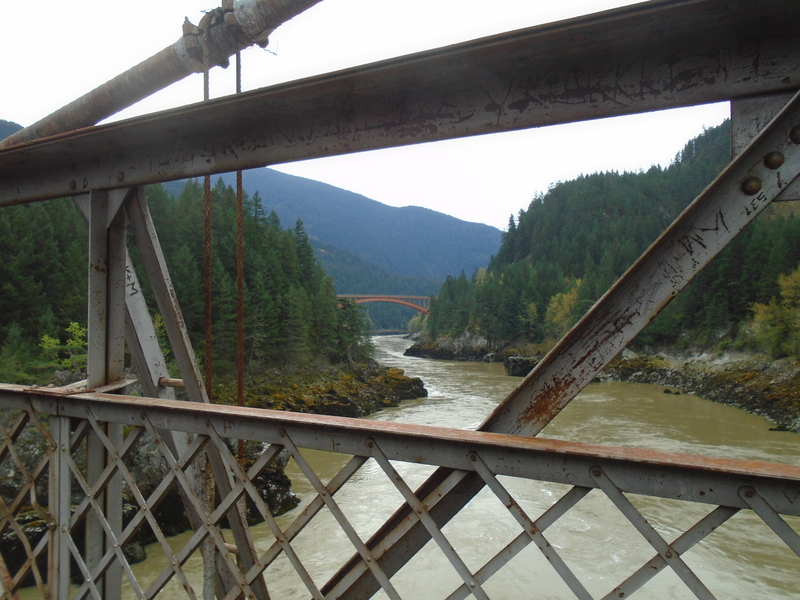 The old bridge is part of the original Cariboo wagon road that serviced the gold rushes of the Fraser and Cariboo. The Alexandra bridge that stands today was built in the exact same spot of the original bridge from in 1861. The current bridge was completed in 1926. There’s a lot of history here. In the second photo you can see the latest bridge in the distance that replaced the old suspension bridge in the 1960s. 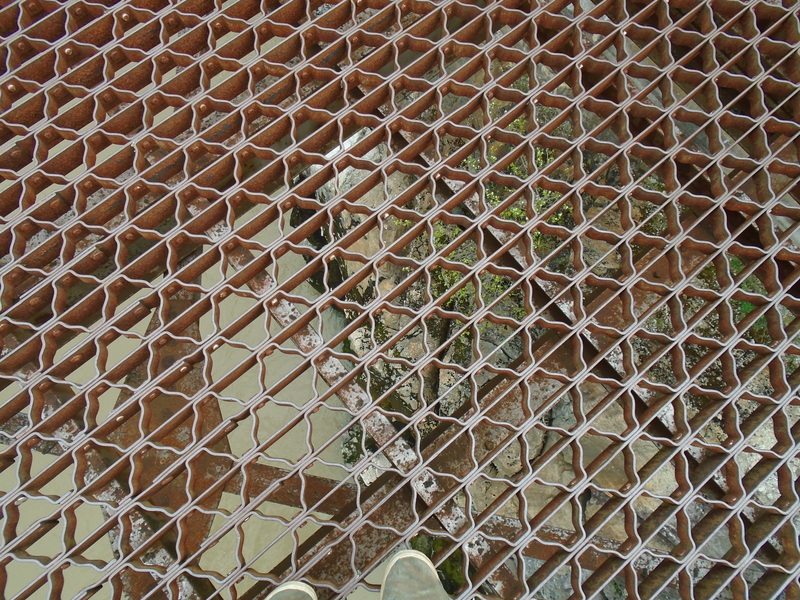 The old bridge has an open grate for a bridge deck. I’m not afraid of heights but it is a little hard to trust a bridge that has been decommissioned. There has to be a reason right? 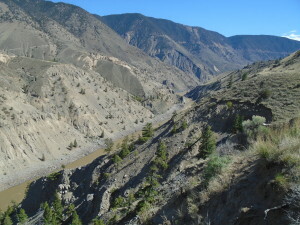 Once again I travelled up the West Pavillion forest service road to do some gold panning. This time though the road frequency had been changed, and the new one wasn’t posted yet. There were some phone numbers and a website posted but this area is outside of cell range so that is not really helpful. 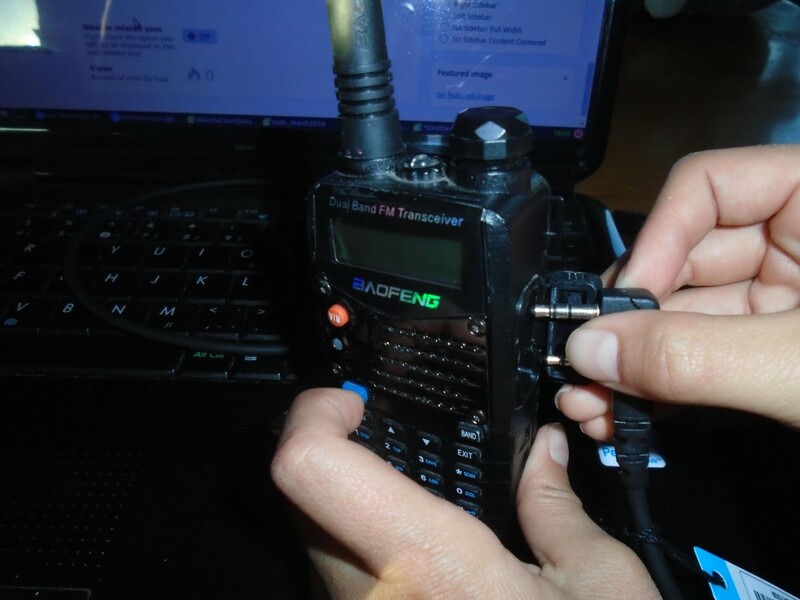 I had a my trusty Baofeng but it wasn’t any good without the proper channel. Here’s a link to the new posted channels for the area, FYI. According to that site the new channel is 150.11 MHz. Fortunately it was a quiet day on the road and I didn’t see anybody. I got to the first claim later that day. 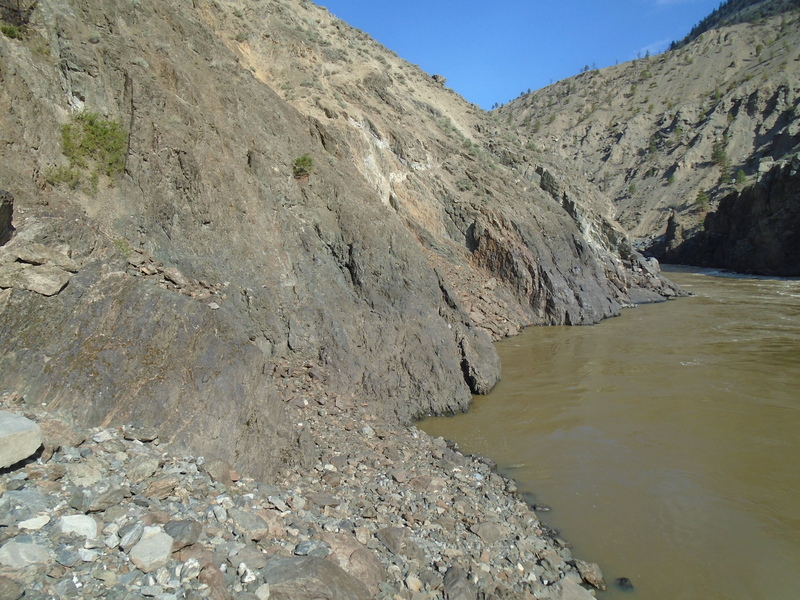 I found a nice camp site near the dirt road and eagerly began hiking down to the river to take my first samples. It looked pretty steep on the topo maps and with my prior experience in the area I was expecting it to be. 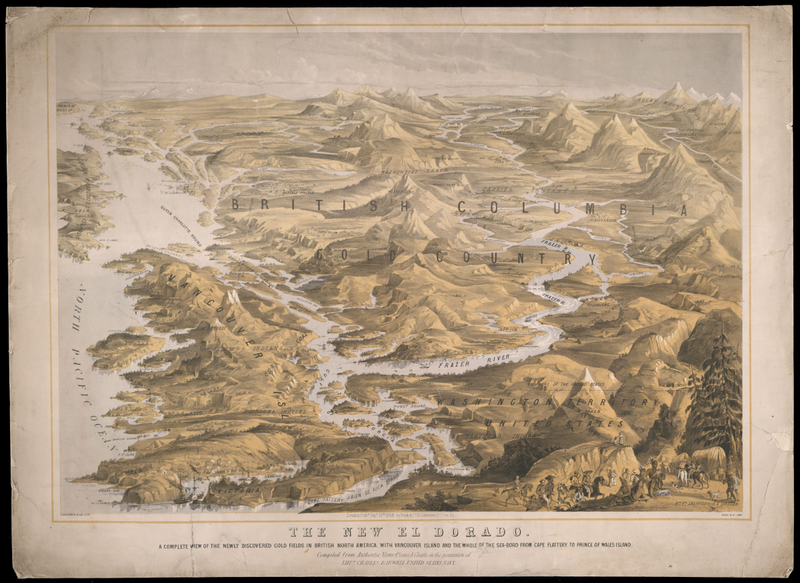 The maps were accurate and it was at least as ugly as I had imagined. Loose gravel and significant slope on the way in. I was hoping to find a more civilized route up once I got down to the river. I managed to get a couple samples before the light started to fade. 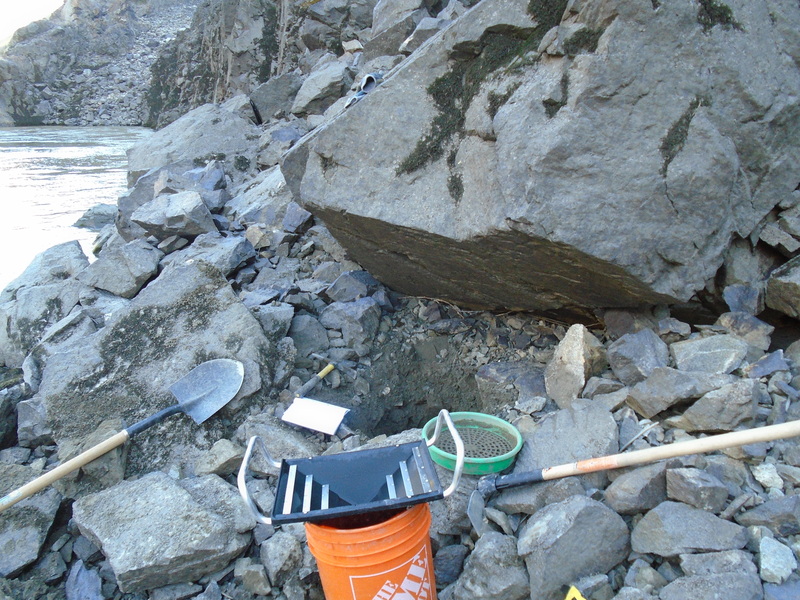 The samples that I take consist of two full pails each, and partially processed on site. I use the pyramid pan to concentrate that down to about 1L and store the samples in a waterproof zip lock bag for the hike out. It takes at least an hour to excavate each test hole in this area due to the abundance of large rocks making up the beach. 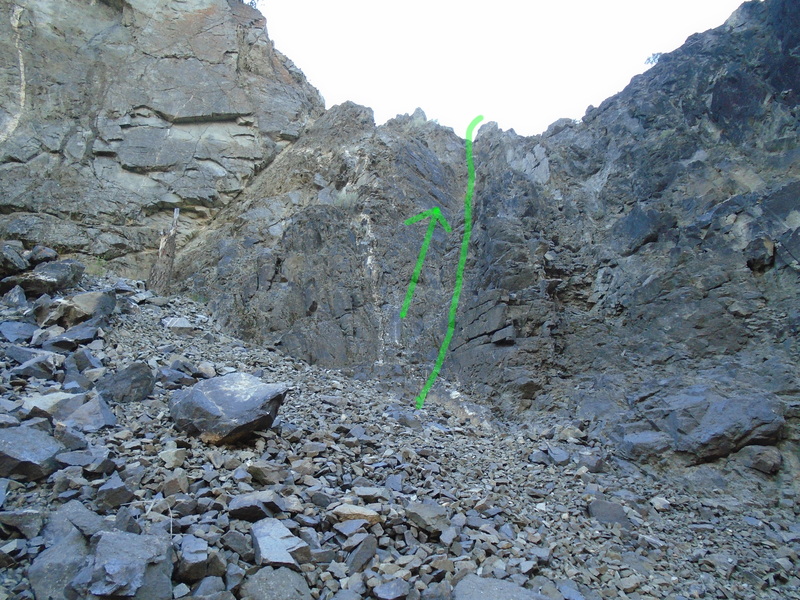 My hope of finding a “civilized” route was not fulfilled, I marked the climbing route in the above photo. 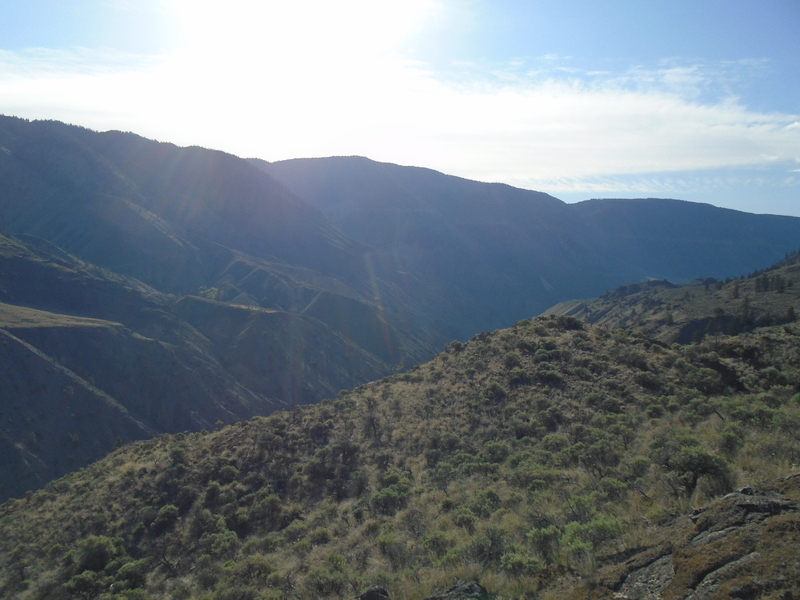 I was faced with either hiking up the super steep talus slope or rock climbing up some exposed rock. I chose the rock climbing. I must mention that I am experienced with rock climbing and don’t recommend this course of action if you aren’t comfortable. Its not exactly safe, especially with a backpack loaded with a pick axe, shovel, 5 gallon pail, samples, gold pans and all the other prospecting gear. Not to mention no rope. I made it up OK, with a little bit of a gut check at the top, then hiked the rest of the steep slope up to the camp for some well deserved beer and food. Little did I know that was just the beginning of the unexpected climbing on this trip. 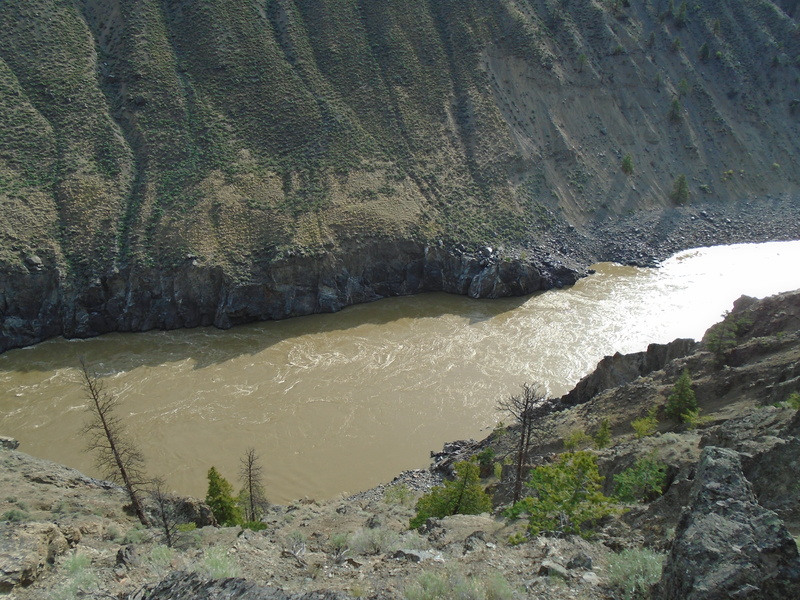 On the previous trip to this area we thought that climbing ropes and gear might be needed for these claims but it was impossible to tell until you come over the edge towards the river. The second claim was just down river from a small canyon. This is a good thing for trapping gold but it does not make for easy access. It all looked good on the way down but it dropped off steeply as I descended towards the river. Pretty soon I found my self perched on top of what was a near vertical drop. I spotted a line down but I couldn’t see the whole path. At this point I was committed. The further I descended the worse it got and next thing I knew I was reverse rock climbing down to the beach. 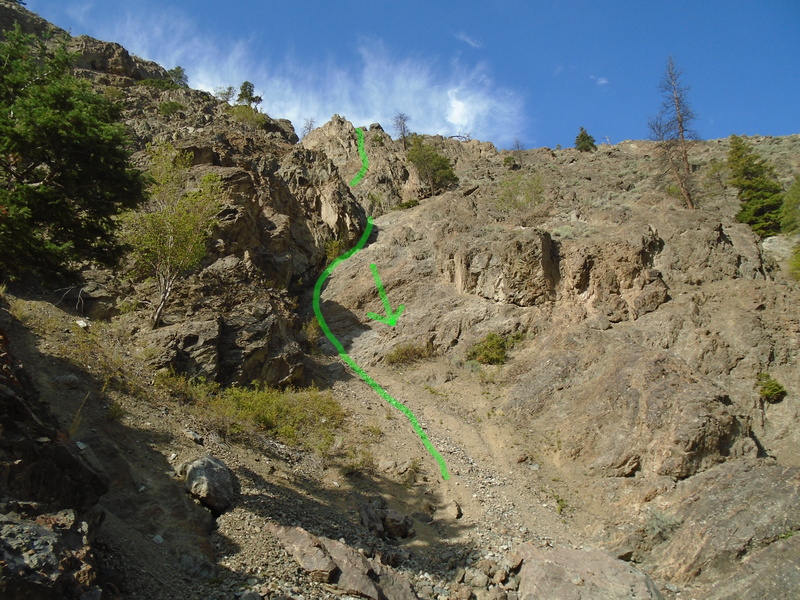 Once again I hoped that I would find a better route up. This time around I knew it wasn’t going to be easy. I had a whole day of sampling to do so I’d worry about climbing out when the time comes. I managed to get three good samples from the beach and inevitably the time came to climb out. I knew the way in was very dangerous and didn’t know if I even could climb back up. 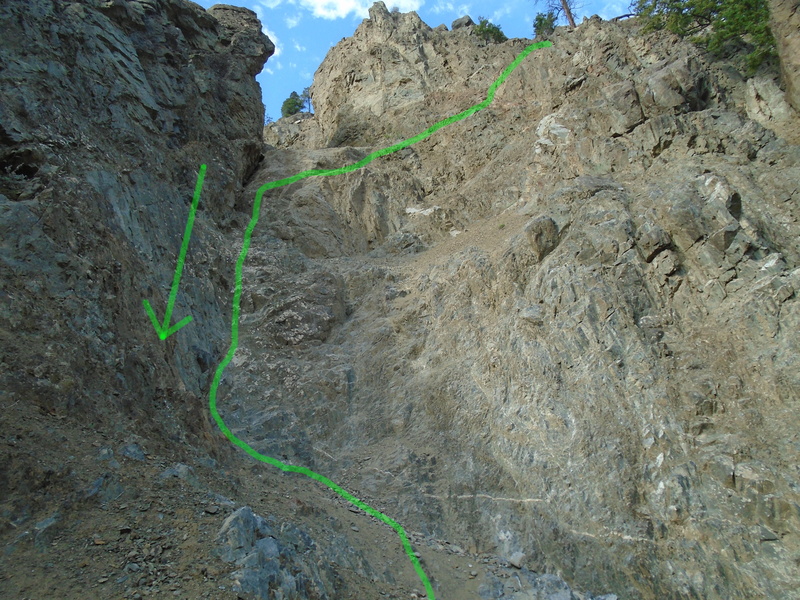 The photos below show the route to the beach. I spotted a route to rock climb out but it was nasty too. It looked like solid rock with good holds so I went for it. It turned out not to be solid and almost every hold I grabbed broke loose and slid down the slope. I got to a point about 3/4 the way up the rock climb section where I was certain that I was screwed. No way up and no way down. Not a good feeling. After several minutes of gathering my courage I decided I had no choice and went for it. 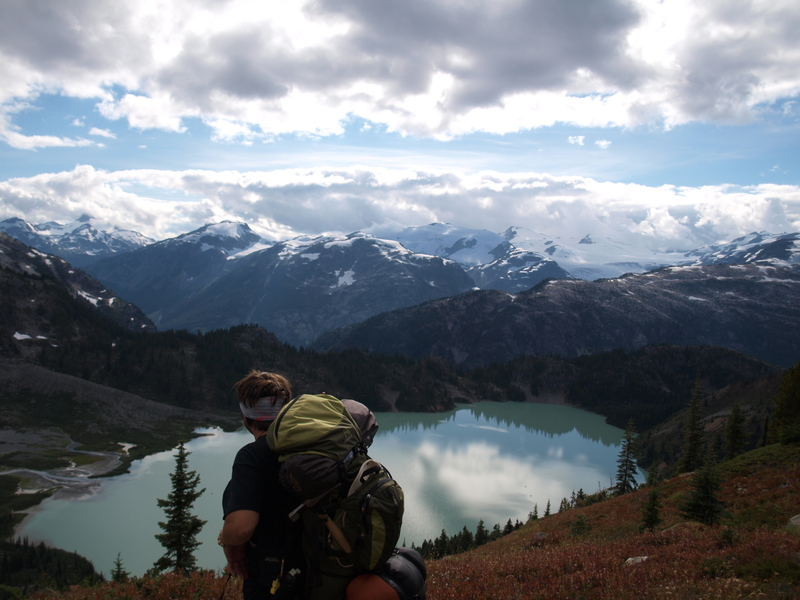 Once I was on top and able to walk on my feet I was relieved and more than happy to hike up the rest of the steep slope to my camp. I didn’t get a great picture of the route up from the beach. 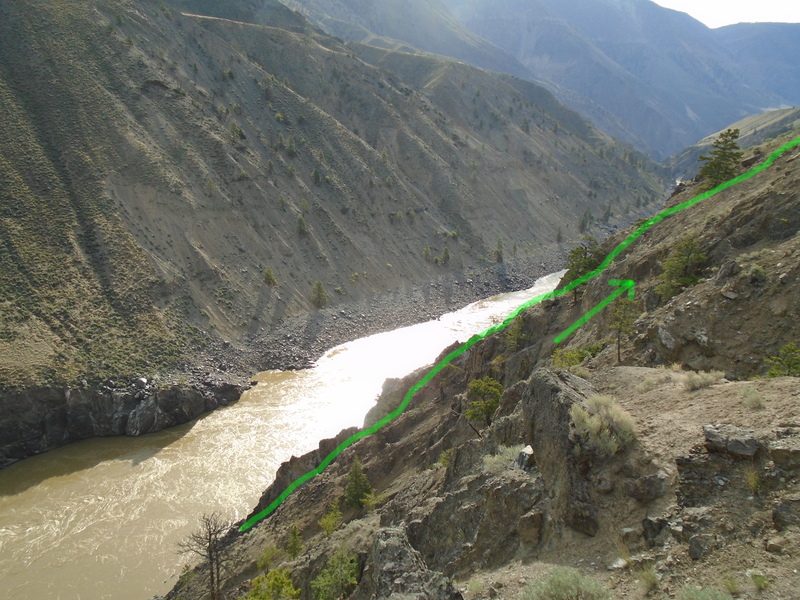 The photo below shows the approximate route. I’ve gotten myself into these sort of situations more times than I’d like to admit. Honestly though the unexpected situations are one of the most exciting parts of prospecting. At the time you are terrified and wonder how you ended up in this situation but afterwards those are some of your best memories. Without a sense of adventure who would go out to these places looking for gold? As luck would have it, these claims actually had some decent gold. The trouble is how am I going to get in there next time?